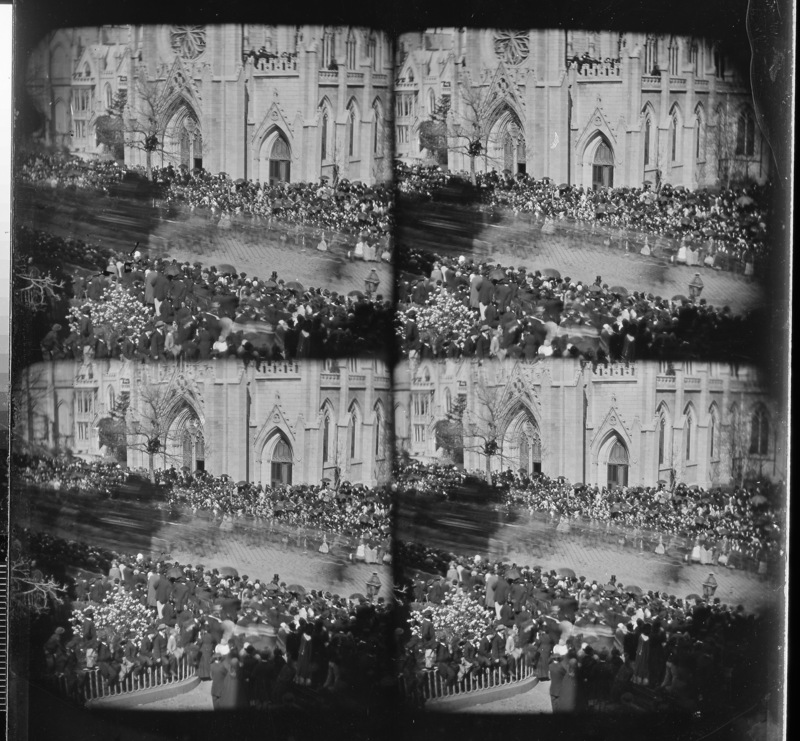 There are clues within these images, as well as in another four lens image of the same scene taken some time prior to the arrival of the hearse, pointing to the conclusion that they were taken on the afternoon of April 25, 1865, 10 days after Lincoln’s death, and show Lincoln’s funeral cortege leaving New York City and continuing on its ultimate journey to Springfield, IL. Don’t miss reading the COMMENTS section of the Washington Post article, as folks have started to weigh in with their own analysis of Mr. Taylor’s exciting new discovery. If you have any comments you would like to post to this blog, please feel free to do so! Over time, this article may be updated to serve as a repository for the reactions of noted experts and amateur researchers to this discovery, so check back in frequently for further updates. 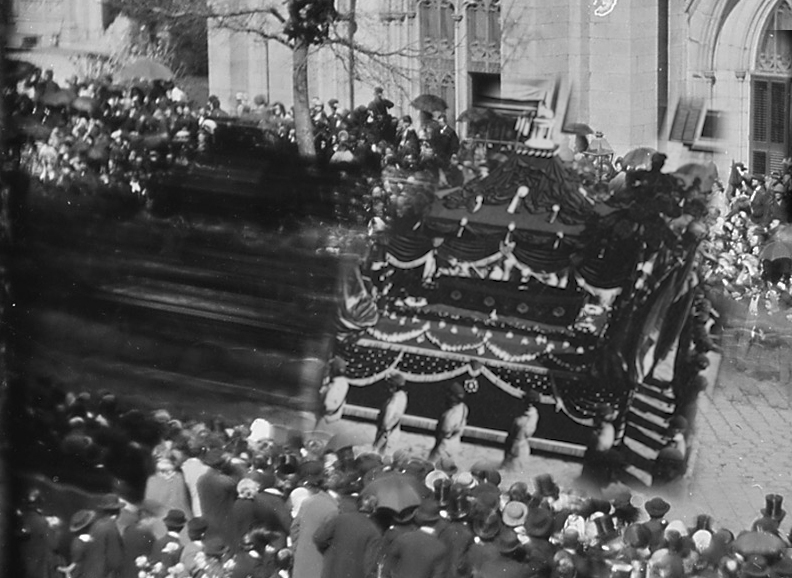 (1) LOCATION: It is clear that NYC’s Grace Church (which still stands) is visible in the images and, therefore, the funeral hearse was heading north on Broadway (moving from right to left) after passing Tenth Street. 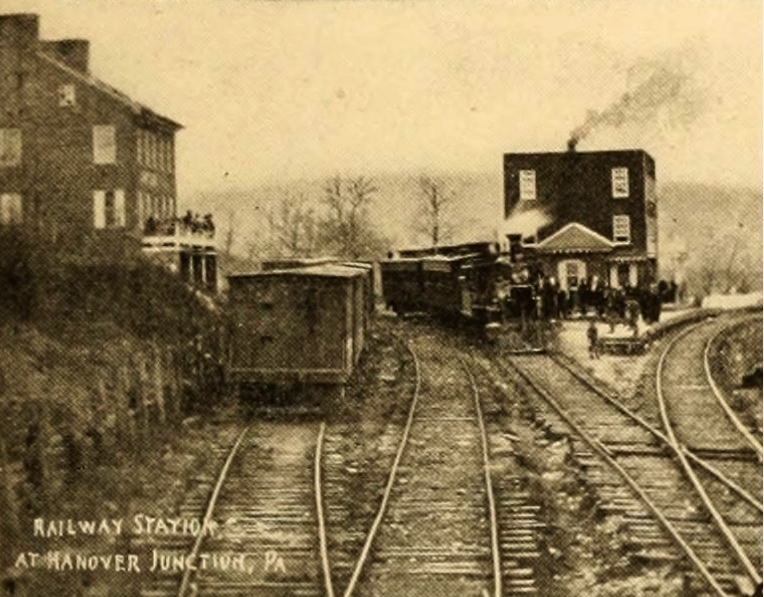 This matches the route taken by Lincoln’s funeral procession on April 25, 1865 when his casket was in the process of leaving Manhattan in order to proceed onto the next leg of its journey to Albany. 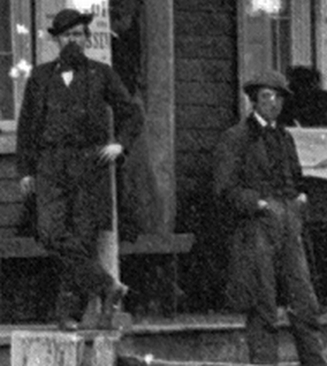 (2) POSITION OF THE CAMERA: The angle at which the images were taken and the fact that Broadway significantly re-orients itself in a more northerly direction after crossing Tenth Street on its way towards Union Square constitute substantial evidence that the four lens camera was located on an upper floor of MATHEW B. BRADY’s photographic studio and gallery at 785 Broadway (Brady leased space there from sometime in early 1860 until about 1873). 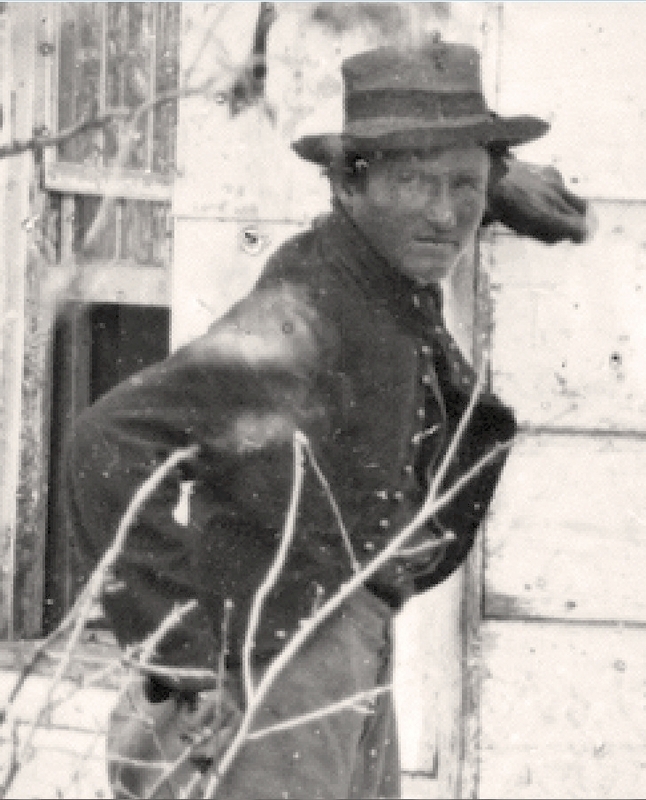 The camera probably was pointed out of a window on the Tenth Street side of the building or was situated on the roof. Therefore, it is almost a certainty that Brady’s camera operators exposed the images taken from this camera position. I believe that the camera was over 100 feet from the hearse at the time of the exposure, which conforms with an estimated range of distances resulting from placement of a camera on the Tenth St. side of Brady’s gallery determined by using Google Map’s Measurement Tool. There had to have been something VERY BIG going on because Brady’s photographers tried to capture a particular but unpredictable moment in time rather than merely a fixed static scene of their choosing. This was challenging because the photographers couldn’t predict exactly when and under what sunlight conditions they would have to expose the glass plate. Rather, they were forced to estimate several minutes in advance when the hearse would come into view, whether it would stop or be in motion throughout, and under what degree of sunlight it would be visible. Glass plates had to be prepared shortly before their use and if the “film” created on them dried out before they were exposed , they could not record an image of acceptable quality. 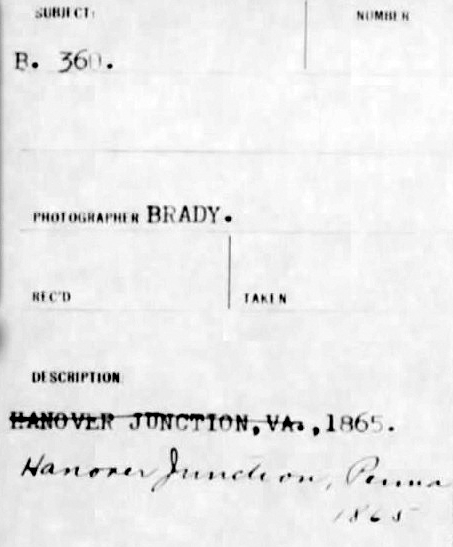 Thus, Brady’s photographers had to try to precisely time the shot and be wary of the possibility that, for example, the sun might dip behind some clouds at the last second, changing all of their prior calculations of how long to expose the plate, which waterman stops should be used, etc. Because they were trying to record the passage of a hearse to capture a moment of HISTORY they had to try to prepare for a number of different scenarios. 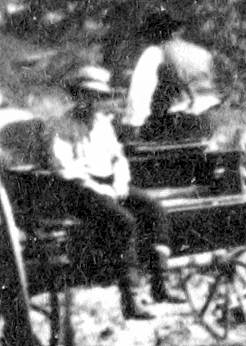 The highly blurred horse-drawn hearse is a product of the multi-second exposure time required of wet-plate collodion photography. Unless the cameramen expected the hearse to come to a complete stop directly across from Grace Church, they would have known that their chances of capturing a clear image of the moving hearse was a long-shot. 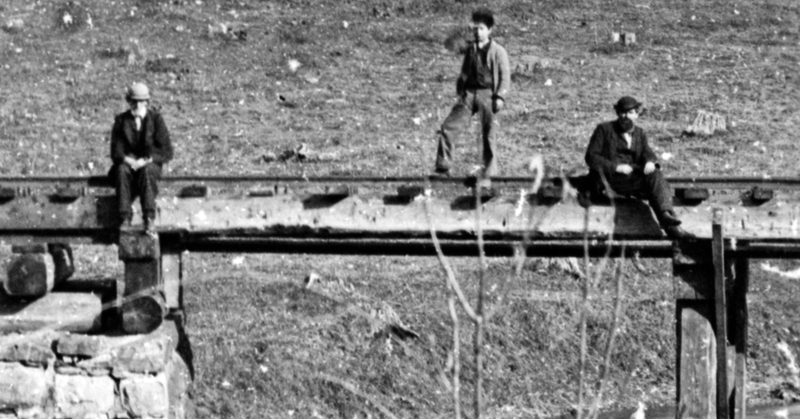 Nevertheless, these unknown Brady camera operators seemingly gave it a try because the magnitude of the historical moment demanded such. (4) TIME OF DAY: The sun shines brightly both on Grace Church and the enormous crowd standing adjacent to it on the opposite side of Broadway, establishing that the sun was beginning its descent to the west in the afternoon. Numerous opened umbrellas and parasols are visible and were deployed to protect its handlers from the descending sun. The earlier exposed view, taken when a portion of a large contingent of about 150 police officers [correction: soldiers] stood on and off to the side of Broadway, illustrates that the sun was significantly higher in the sky at that time because some of the policemen standing on the street cast a southerly shadow onto its pavement. In the later National Archives images, the passing hearse appears not to cast ANY southerly shadows behind it. The distance between City Hall and Tenth St. on Broadway today is about 22 blocks (1.45 miles). The procession was supposed to leave City Hall at 1 p.m. on April 25th and Lincoln’s casket was to be out of the city by 4:15 p.m. 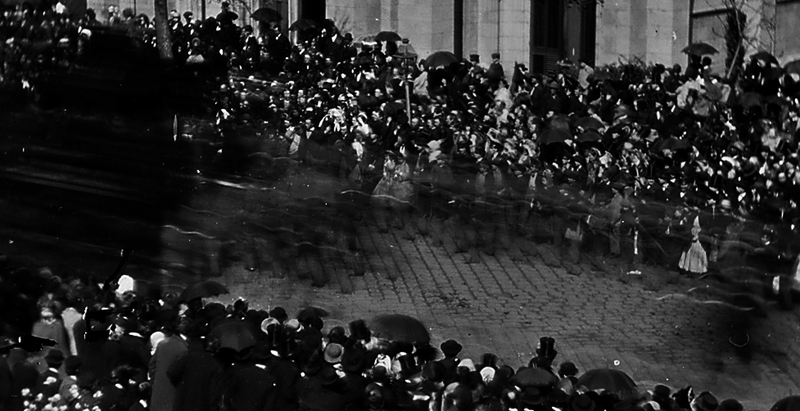 The actual time his catafalque began moving down Broadway and reached its terminus in Manhattan may have been different if the newspaper reports are accurate — for example, the April 26, 1865 edition of the New York Tribune reported that “precisely at two o’clock, the vast Cortege began to move from City Hall, and without any delay worth mentioning continued until 4:10 o’clock, when the end passed through the Park, the Procession, exclusive of the military, thus occupying two hours and ten minutes in passing.” Nevertheless, it can be estimated that Lincoln’s hearse could have passed by Brady’s photographic gallery anywhere between 2:30 to 3:30 p.m.
(5) REACTION OF THE CROWD: The people on the opposite side of the street battled a mid-to-late afternoon sun. Along with the ladies hiding under their parasols, a few men can be seen holding their hats in front of their faces and angling them in order to shield their eyes from the sun as the hearse passed. Most of the men positioned closest to the hearse just as it passed by them in front of Grace Church are hatless. A majority of the men back towards Tenth Street who presumably had doffed their hats as the hearse moved by them a few seconds earlier had replaced their hats on their heads. It is possible that the Brady cameramen expected the hearse to stop after crossing Tenth so that they could capture it motionless in full sunlight. 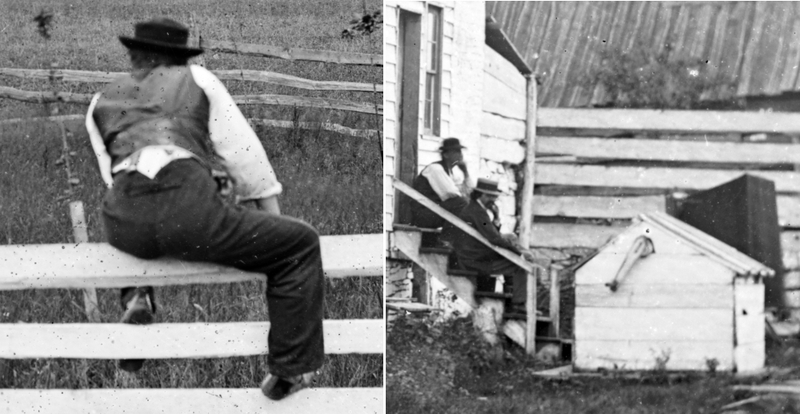 But the resulting image probably reflects the vagaries of both expectations or hopes unmet and the difficulty of precisely timing a collodion wet-plate photograph (given the several minutes of preparatory time required to adjust the optical focus, set waterman stops, and prepare the glass plate for use by “flowing it with collodion, soaking it in a chemical bath, drying it, placing it in a light-proof holder, and inserting the holder and plate into the back of the camera, etc.). Consequently, the hearse was captured when it was moving + within very dark shadows cast by a building on the other side of Tenth opposite Brady’s building possibly at either 787 or 789 Broadway. The dark shadows falling on the hearse and the soldiers marching in accompaniment at the sides of and behind the hearse coupled with their movement throughout the exposure make it extremely difficult to analyze details relating to the hearse or the soldiers. 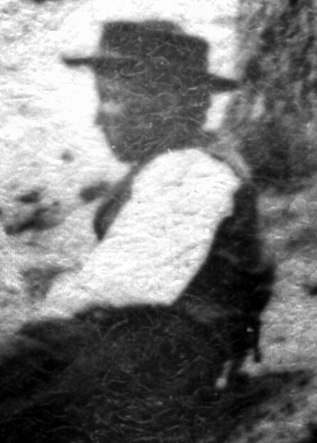 Four dark feathered bundles of giant ostrich plumes encircling Lincoln’s casket appear to be visible as a blurry mess in the images. 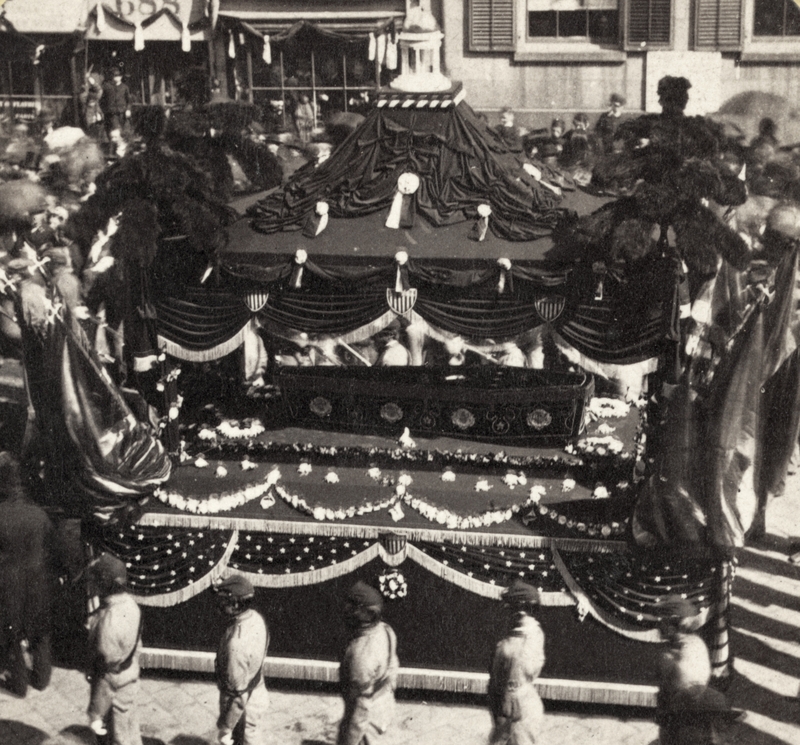 Other readily observed features include a wavy garland of white flowers and light-colored fringe at the base of the hearse’s dark cloth enclosing its bottom-most portion, both of which are visible in other Lincoln hearse images. What is not visible atop the catafalque is a miniature version of the Temple of Liberty which is discernible in other Lincoln funeral procession photos and sketches. Perhaps it was removed when the casket was publicly displayed at City Hall on the prior day and not put back on the hearse. A more likely explanation, however, is that it cannot be seen simply because of the distorting and “ghosting” effects of motion. There is evidence that a similar column of soldiers flanked the hearse on the western (nearer) side of Broadway too. 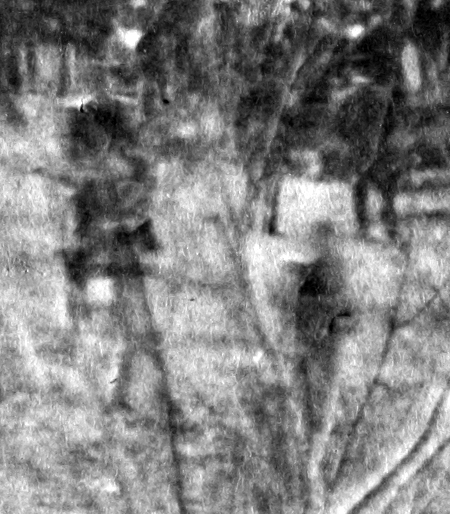 Their upper torsos were largely obliterated by their movement during the exposure, as occurred with respect to the soldiers on the east side of the street, leaving only exceedingly faint and blurred “ghost” traces of their presence overlaying the cobblestones. Compare the soldiers’ optical impact upon the cobblestones on the west side of Broadway with the clearly defined joints visible within the cobblestones situated in the middle of the street. 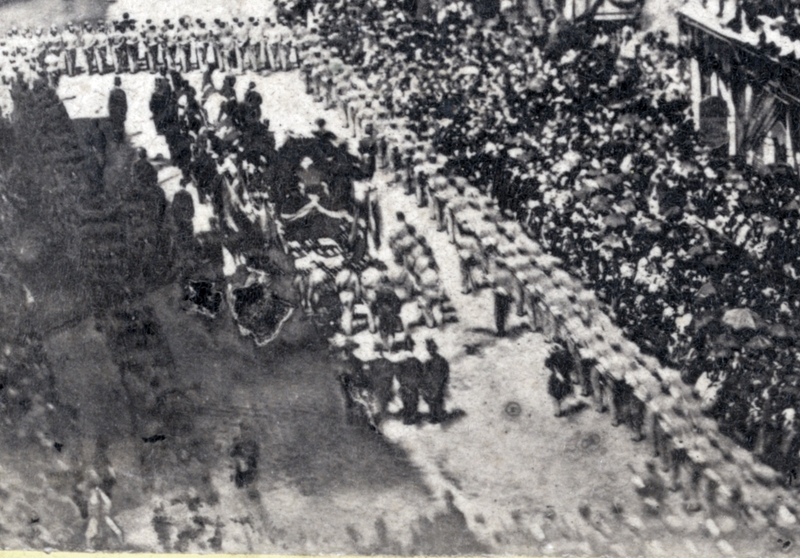 Finally, the group of soldiers immediately trailing the hearse and the four or five men trailing behind at a close distance in the cropped detail from Library of Congress image, above, also seem to be trailing the mystery hearse in the National Archives images at a similar distance. (8) THE DOUBTERS: The blurred hearse, horses, and soldiers do not allow for an easy identification of the hearse as Lincoln’s funeral cortege. 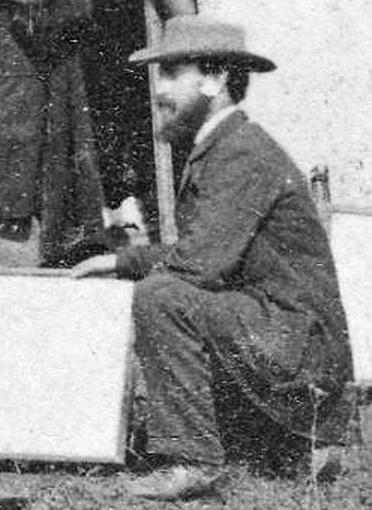 Skeptics are able to point to the absence of specific details (including the previously mentioned miniature version of the Temple of Liberty) as evidence that this is not Lincoln’s hearse. The aforementioned poster “mmoretti” maintains that the shadows seen in the Library of Congress stereo view taken on the same day across from 688 Broadway about 6 blocks to the south of Brady’s gallery sometime shortly before the hearse’s arrival at Grace Church — were pointing roughly northward, contrary to the shadows seen in the National Archives’ views. However, if that stereo view was taken at 688 Broadway, the angle of the shadows cast actually pointed eastward (because of the northeast by southwest orientation of Broadway at that point), mirroring the shadowing from the buildings seen in the National Archives images. Someone whom I am quite sure was not laid out to rest in that casket is Ulysses S. Grant. 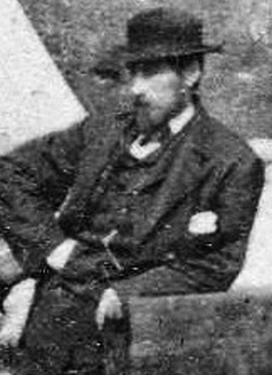 By the time of Grant’s funeral procession in New York City on August 8, 1885, much faster speed dry-plate photography was in vogue, telegraph, telephone and electrical poles and lines littered the major streets of New York City, the leaves on trees would have been at their collective peaks, and the crowd would not have been dressed as they appear in the National Archives images. 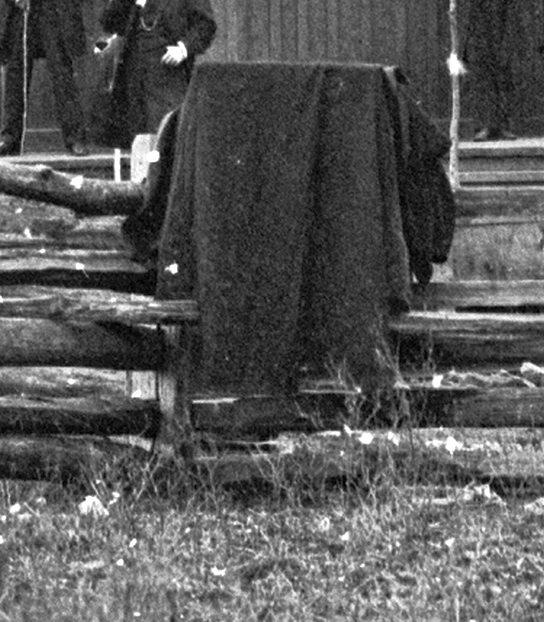 Nevertheless, in expressing his skepticism that the images show Lincoln’s funeral procession, Mr. Natanson of the National Archives is not alone as there are a number of researchers investigating whether they can show that the National Archives images represent the funeral procession of someone other than Abraham Lincoln. Since the last update, some insightful commentary particularly relating to the miniature Temple of Liberty crowning the top of Lincoln’s catafalque has been received from two gentlemen. 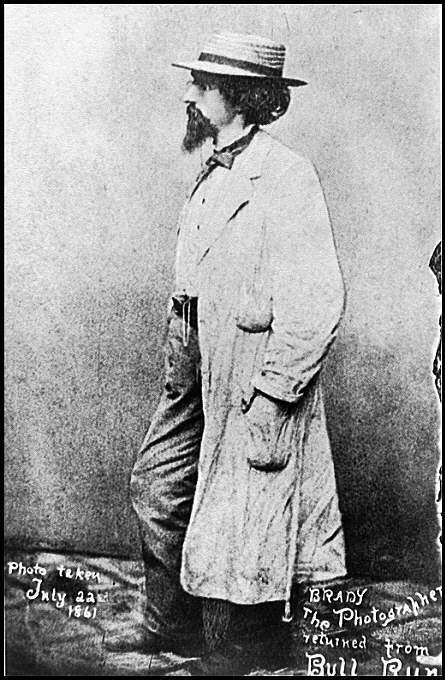 The first, Mr. John Woodman, has written an excellent piece about his own analysis of the images at: http://www.springfieldcomputerguy.com/analysis-brady-photos-president-abraham-lincolns-funeral/#comment-509. I recommend that anyone with an interest in this subject matter take a look at John’s work, especially his side-by-side comparison of the hearses marked with numbered specific details shared by each. He also raises the point that if you, likewise, conclude that the hearses are a match, then another point merits consideration. The Lincoln funeral hearse designed by Charles Mettam, an architect, and built by Peter Releyea, an undertaker, was unique as it was commissioned for this specific event and only used on April 24-25, 1865 and for several re-enactments staged in conjunction with Fourth of July celebrations in New York before its ultimate retirement. 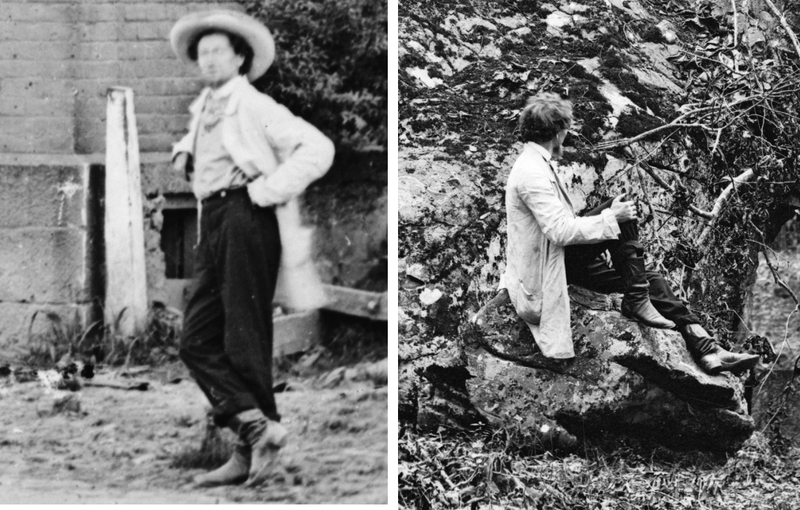 As Mr. Woodman points out, it can be easily concluded that the scene depicted in the National Archives images was not taken on July 4 of any year in which wet-plate photography was still in vogue. 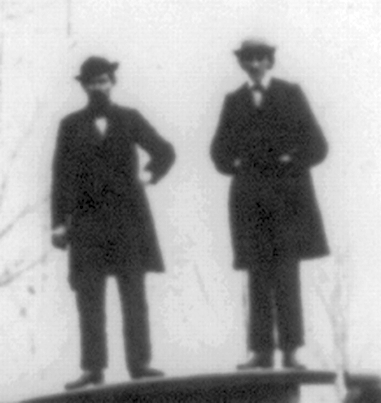 Noting that the Lincoln funeral car used in Philadelphia, for example, did not resemble the Mettam/Releyea funeral car, Mr. Woodman concludes it is highly unlikely that any other hearses were trotted out in New York City during the age of collodion wet-plate photography which would have precisely mimicked this one. Relative to the Temple of Liberty ornament, Mr. Woodman writes: “A white blur is visible corresponding to the top ornament. 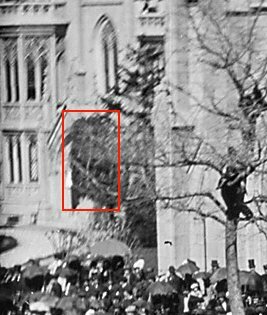 This is more visible at bottom than at top, although in one adjustment of the photo I was able to see it at top as well.” All of this adds up to further powerful photo-analysis supporting Mr. Paul Taylor’s conclusion that the images depict Lincoln’s hearse. Speaking of Mr. Paul Taylor, he also has graciously posted a comment at this https://abrahamlincolnatgettysburg.wordpress.com/ blog. 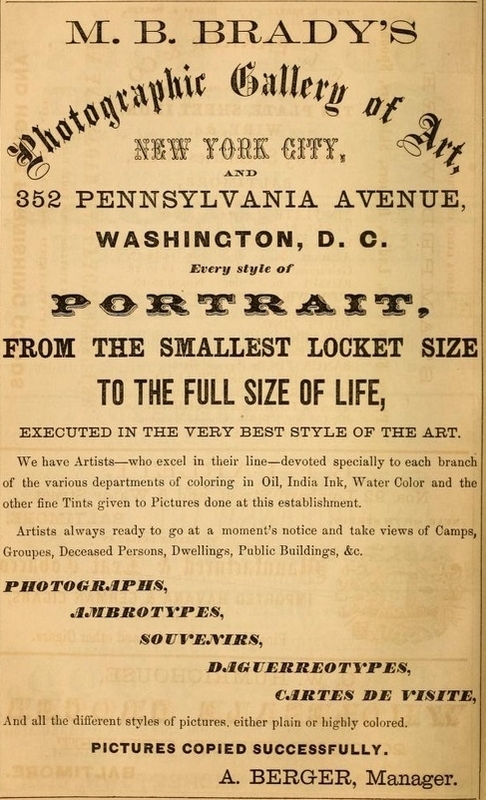 His comment addresses the oh-so-hard-to-see miniature Temple of Liberty. 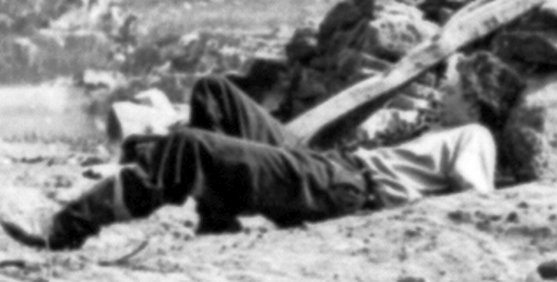 Mr. Taylor writes — “that was the toughest thing for me to find. To get a brand new perspective, I did a top/down (just using one side of the quad) instead of the usual left/right (sideways) red/cyan anaglyph and rotated it 90 degrees so I didn’t have to twist my neck to orient it the same direction as my red/cyan glasses and saw it. After that I saw it in every view – I circled it on my flickr posting.” With that helpful comment in mind, I looked at a red/cyan anaglyph created from the National Archives images which was shared with me by a noted Civil War photo-historian colleague. I was able to make out five or six images of the miniature Temple of Liberty within the shadows. 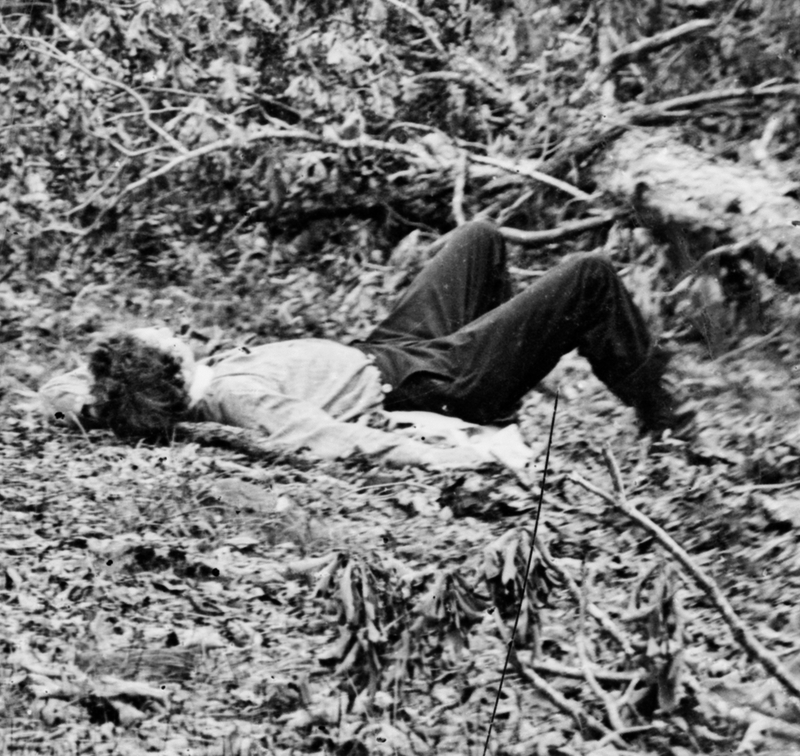 The multiple images are the result of the hearse’s movement throughout the exposure. As Mr. Woodman notes, seeing the base of the Temple was easier than seeing the top portion. But after acclimating my eyes to the 3-D effect created by the blue/cyan glasses, both the top and bottom portions of the miniature Temple became visible. Thank you Mr. Woodman and especially Mr. Taylor! The final comment I’ll offer relates to Mr. Woodman’s estimate of a 10 second exposure time. Although I agree that the white wavy lines created by reflective items on individual members of the honor guard — and even the end-to-end spacing of the multiple images of the Temple of Liberty — are good markers of how far objects moved during the exposure, I don’t believe that the exposure time was as much as ten seconds. 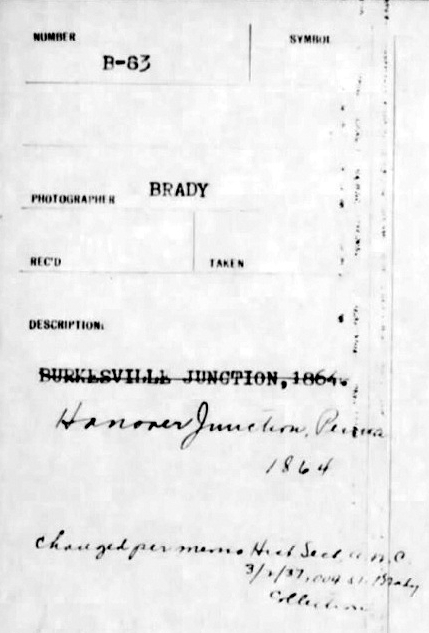 Given the amount of bright sunlight and the fact that the Brady cameramen probably would have used both their “fastest speed” batch of collodion on the glass plate and done everything they could in setting up the shot to minimize the overall exposure time, I’d guess that the overall exposure was no more than five, six, or even seven seconds. 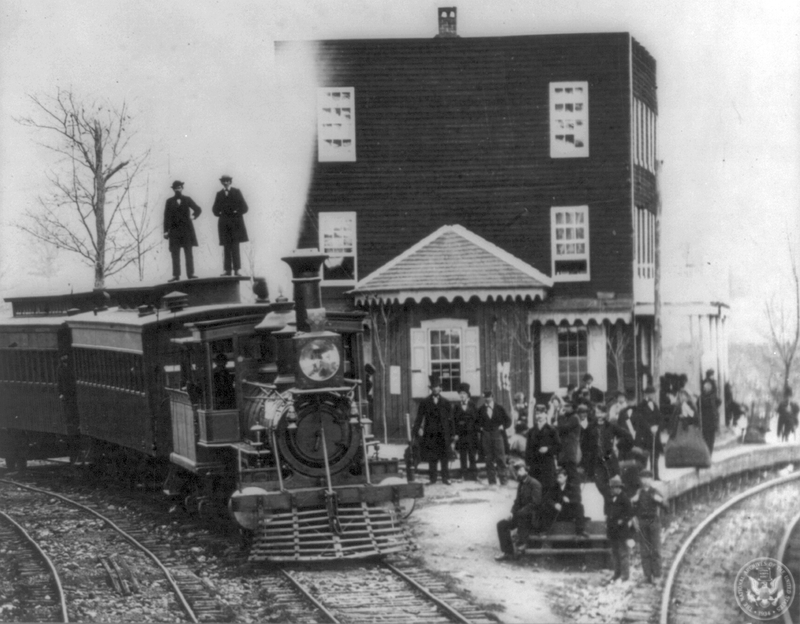 If so, the procession might have been shown speeding up a bit after first slowing at Tenth Street due to the narrowing of Broadway noted by Mr. Woodman. Because we don’t know exactly how fast the procession was moving during the exposure, reliance upon the estimated speed of the hearse pulled by sixteen horses and the surrounding foot soldiers can only offer us a range of estimated exposure times. 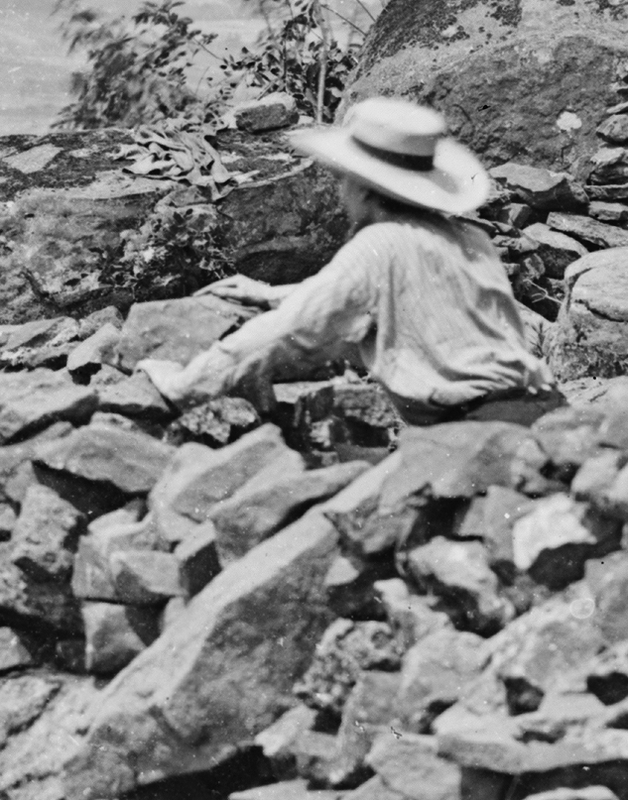 Searching for National Archives digital photographs using NARA’s Online Public Access (OPA) can be very frustrating and does not always yield results in the same manner as the wonderful Library of Congress’s Prints and Photographs Online Catalog. Only yesterday did I finally discover the location of the National Archives’ full-size copy of the first of the two four-lens images showing Grace Church. I needed a fellow researcher to direct me to where it was hiding. With that four-lens image loaded on my hard-drive, I was then able to come to the conclusion that the large contingent of uniformed men whom I previously assumed were police officers are probably all soldiers. 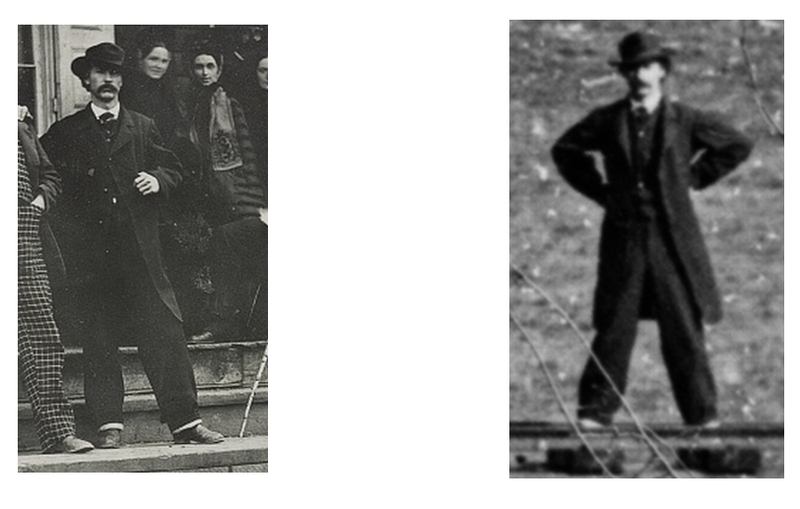 Noticing new details, I was struck by a great contrast in the behavior of the crowd in the two four-lens images. 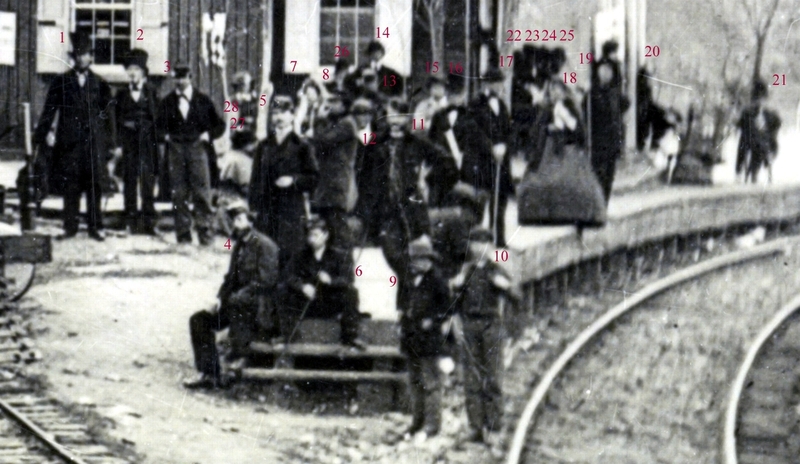 In the image showing Lincoln’s hearse, I cannot find a single person looking up towards the position of the Brady cameramen. 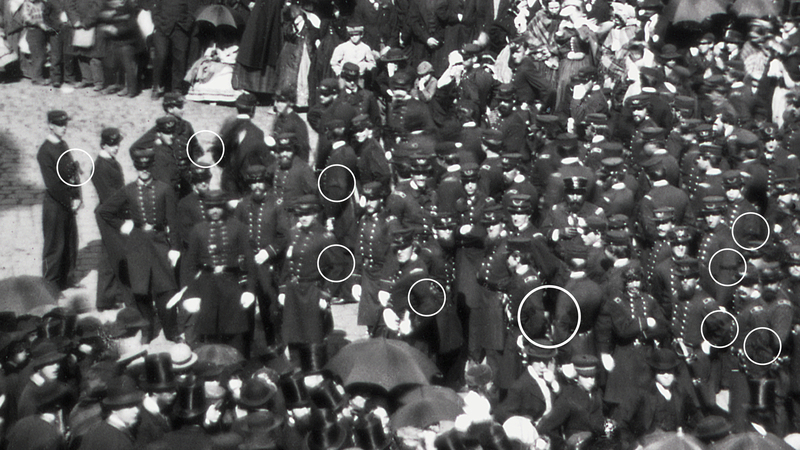 But in the first image, I count at least 57 spectators and soldiers looking up at and/or posing for Brady’s camera (see marked image below) — behavior which stands in marked contrast to the intense level of attention later directed towards Lincoln’s hearse and the rest of the procession of soldiers and dignitaries trailing immediately behind it. 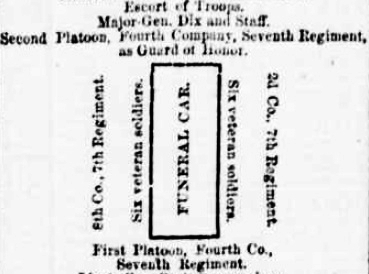 That there were so many soldiers situated in advance at just one street corner is additional proof that the individual in the casket carried in the later-arriving hearse wasn’t just a run-of-the-mill dignitary. The April 2014 edition of Battlefield Photographer (The Newsletter of the Center for Civil War Photography) just arrived! At pp. 16-18, it features an article by Bob Zeller about Paul Taylor’s discovery. 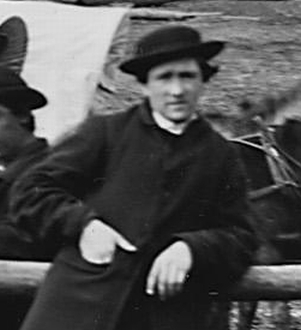 “A Major Brady-Lincoln Photo Discovery” explores the story behind Mr. Taylor’s detective work in even greater depth and more fully lays out the reactions of members of the National Archives. Not to be missed! How does one obtain a copy of the article? 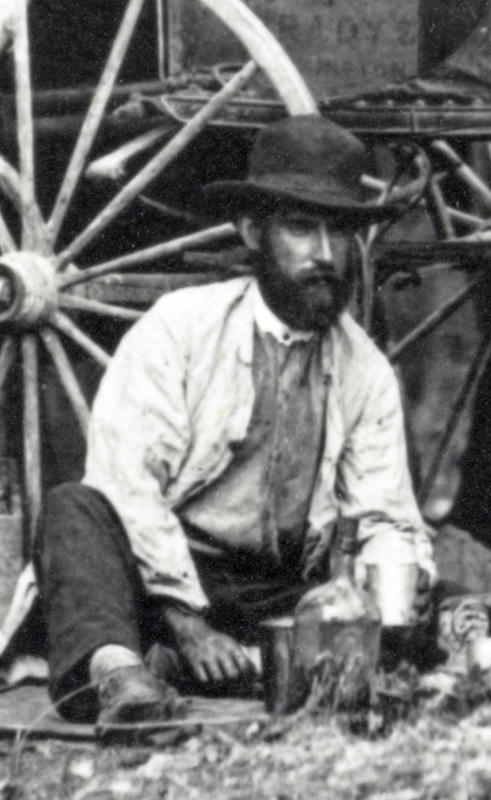 All that is needed is to submit an online application for membership with the Center for Civil War Photography (CCWP) and the magazine — which also contains several other fascinating articles relating to Mathew B. Brady — can be yours along with all of the other goodies that go along with being a paid member. See: http://shop.civilwarphotography.org/Memberships/. 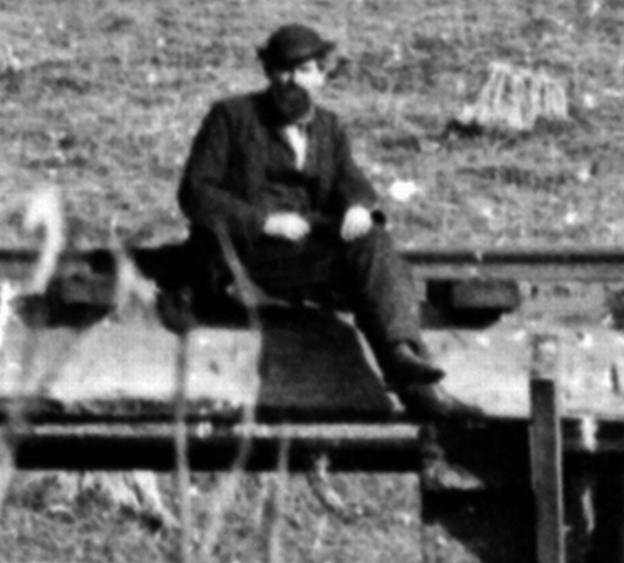 Also, Paul Taylor has posted a number of marked or enhanced images of the April 25, 1865 New York City hearse photos at his flickr page which better reveal his analysis at: http://www.flickr.com/photos/110677094@N05/. Be sure to check them out and don’t miss the other 3D images he has created as anaglyphs, including from the surface of Mars, planetary images of Saturn and its moons, Teddy Roosevelt, and various Civil War photographs. Just don’t forget your red/blue 3D glasses before you visit his flickr page. If you don’t own any cyan/blue glasses, you needn’t worry, because you can receive a pair from the CCWP after becoming a member. 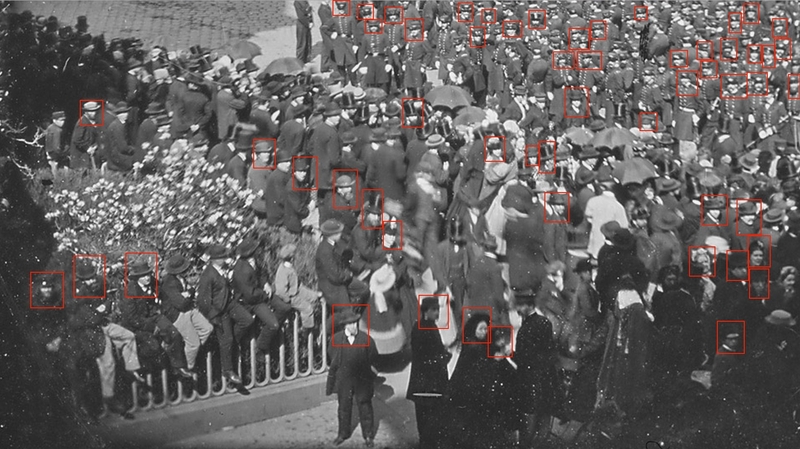 Although the official caption received by NARA from the Army Signal Corps, and appearing as well in the 1897 War Department Library Catalogue, is generic, an investigation carried out by researcher Paul Taylor in early 2014 pointed out evidence suggesting that the event being observed by the crowd in this photograph, as well as in the related 111-B-2172 (NARA Identifier 526367), is the Lincoln funeral procession in New York City, on April 25, 1865. 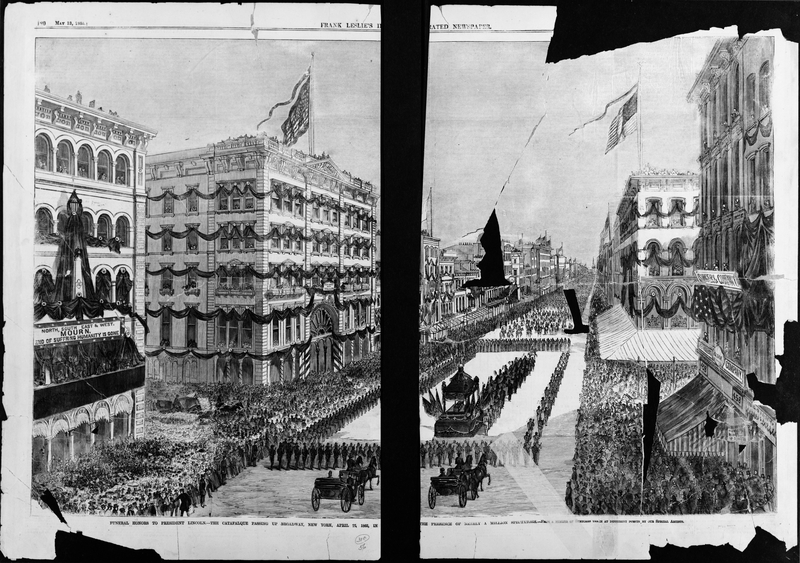 Examining digital reproductions of both images, and drawing on various external sources, Taylor built his case for such rare photographic subject-matter around the following: the match between the church in both images and known views of New York City’s Grace Church at Broadway and 10th Street; contemporary newspaper accounts of the procession route, clearly taking it past Grace Church; biographical sources placing Mathew Brady’s New York photographic studio across the street from Grace; the notable size, and apparent solemnity, of the crowd in these images; the springtime tree blossoms evident in these images; and significant points of correspondence when comparing the size, shape, and discernible features of the large blurred object seen at the left in 111-B-2178, with characteristics in a known photograph of the specially designed Lincoln hearse, or catafalque, used in the New York City procession. 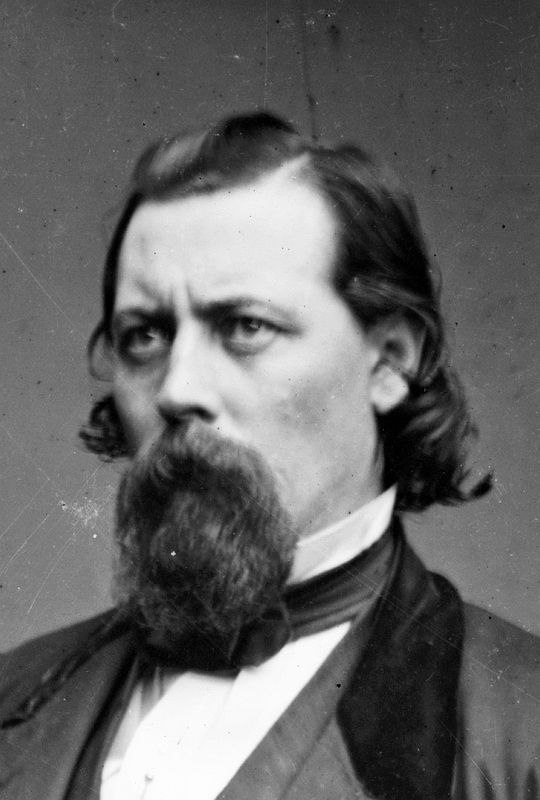 Taylor’s findings, which he reported to NARA, received widespread media publicity, and were subsequently endorsed by Center for Civil War Photography President Bob Zeller, Lincoln funeral scholar Richard Sloan, and others, including another researcher, John Woodman, who reported results of his own independent analysis to NARA. 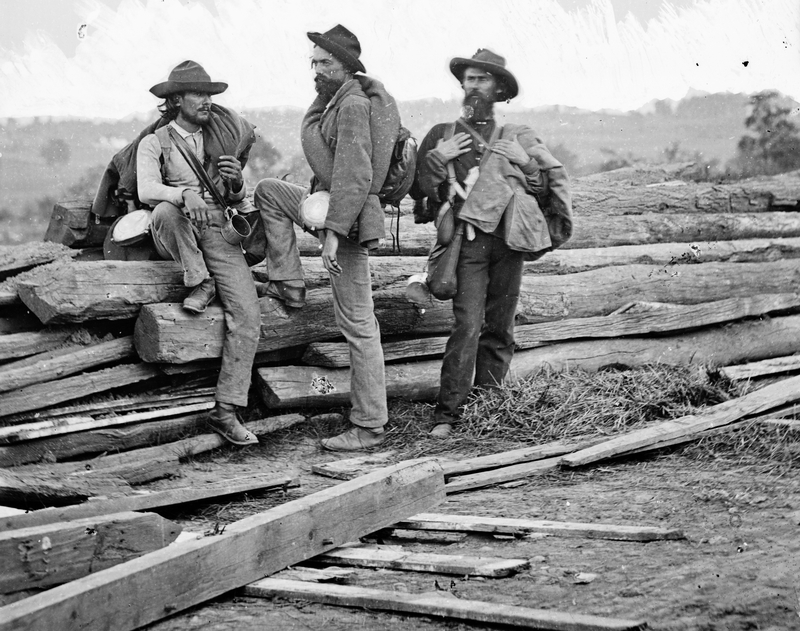 A full account of the Taylor research can be found in the April 2014 issue of the Center for Civil War Photography Newsletter, Battlefield Photographer. Official Army Signal Corps captions and 1897 War Department catalogue entries often are overly generic and can be replete with errors. 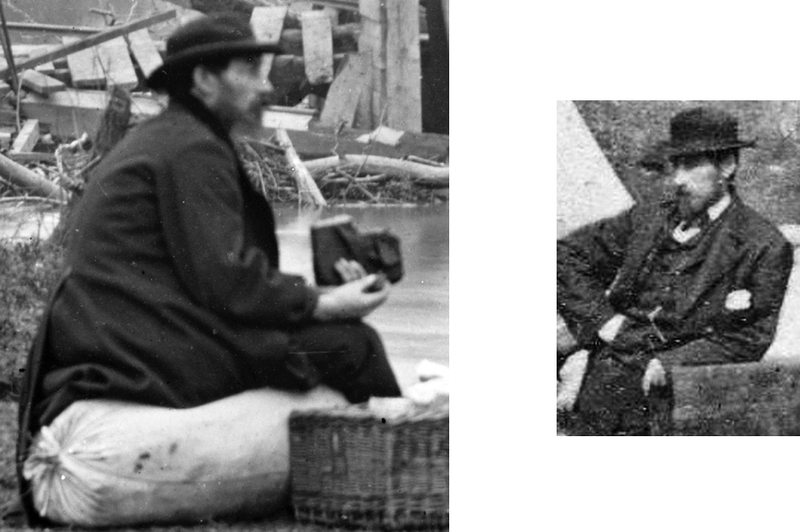 Even Civil War photographer’s or publishers’ captions & catalogue entries are prone to both minor and major mistakes and omissions. 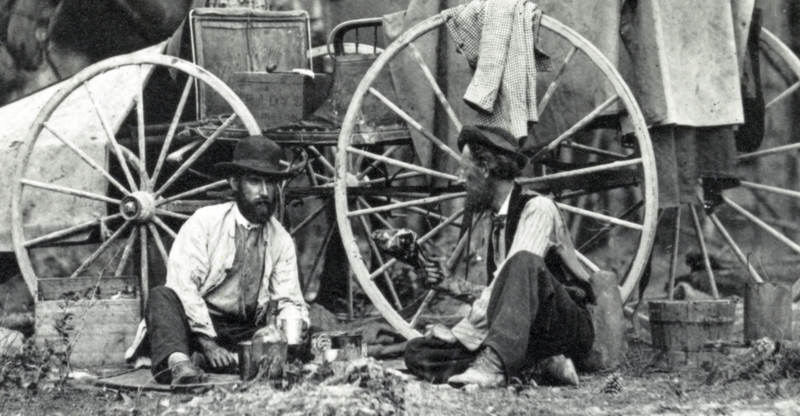 Thus, the careful study of what can be seen in a Civil War era image often is far more reliable on the topic of “who, what, when, and where.” Congratulations especially to Paul Taylor and John Woodman for the deserved recognition they have received. Paul Taylor also has pointed me to a markup he created based upon the work of our fellow CCWP member, Steve Wolf, in April 2014. 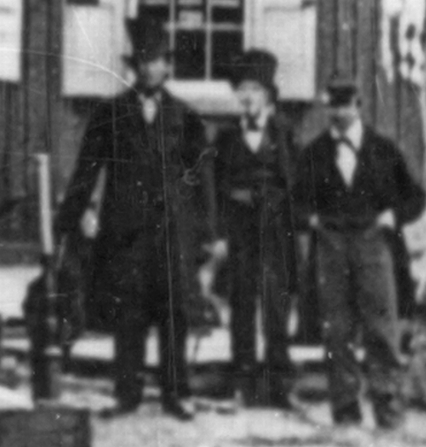 That markup shows many soldiers standing on Broadway Ave. in front of Mathew Brady’s gallery wearing mourning bands. Just another piece of evidence supporting the overwhelming conclusion of what the view depicts!